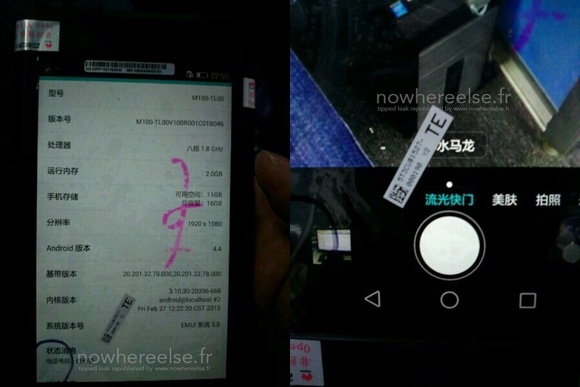 Alleged live photos of a Huawei P8 prototype made the rounds online. The Chinese tech giant’s next flagship smartphone will make its official debut next week, on April 15. The images reveal the upcoming smartphone in a case, which is designed to hide its identity. Manufacturers usually ship unannounced devices to in such covers to wireless carriers for testing. A shot of the device’s settings menu reveals its specs. They include 1.8GHz quad-core CPU, 2GB of RAM, 16GB of built-in memory, and 1080p display. The OS on board is Android 4.4. with EMUI 3.0. Past rumors have pointed a 3GB of RAM for the device, though we won’t be surprised if Huawei offers different memory variant as it has don't in the past.The lower amount of RAM could also mean that the device in question is the previously leaked Huawei P8 Lite. So far, it seems that Huawei P8 will be available in a number of different variants. Thankfully, we won’t have to wait long to find out what the company has in store.